From BlogTalk Radio Show Let’s Ask the Angels October 5, 2013. This week I was guided to use the newly released Archangel Power Tarot Card Deck by Doreen Virtue and Radleigh Valentine. For the beginning of the week we have the card , ACE OF MICHAEL. The message is, “ A wonderful new idea! Don’t allow bumps in the road to hinder your progress. 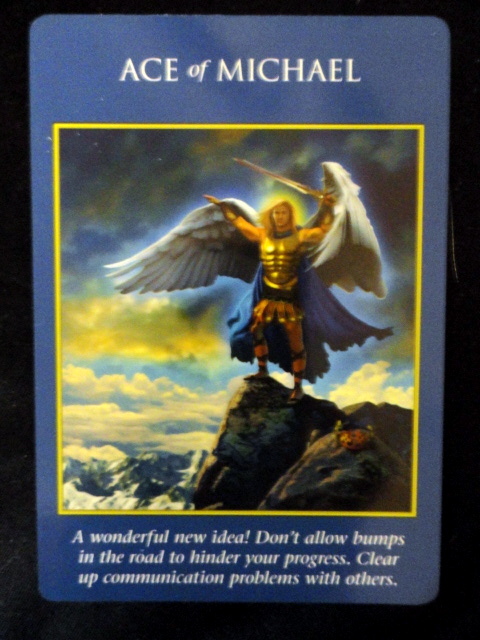 Clear up communication problems with others.” The image on the card has Michael on top of a mountain arms raised in confidence holding his sword of white light, standing between heaven and earth. Michael is with you providing all the confidence and support you need. That wonderful new idea you have? Go for it! The pathway is totally open and even more insights will appear to assist you to make it happen. If any obstacles come up, not to worry stay focused on your vision while taking movement forward. This is also a message about addressing any communication misunderstandings or issues that may be present. It’s better to address them now and take any distractions out of the picture. Get to the truth of the matter and be honest with yourself. Continue to look to your dreams and stay focused. 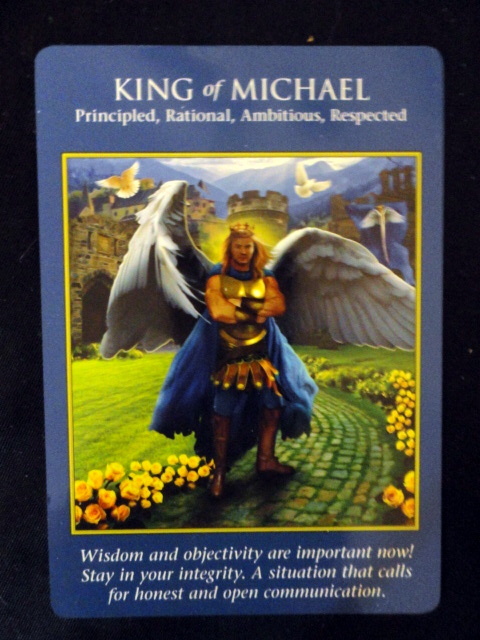 For the middle of this week we have the card, KING OF MICHAEL.The message is, “ Wisdom and objectivity are important now! Stand in your integrity. A situation that calls for honest and open communication.” Again we have a message about going forward with cleaning up any misunderstandings in communication. Michael is assisting you with your honesty,integrity, confidence and courage. If need additional support use an expert or coach to assist you. It’s all about being discerning with your choices so that they are based in wisdom , objectivity and integrity. Stand in your power! You can call upon Michael before you go to sleep to enter your dreams to assist you, heal or solve any situation you are dealing with. You may or may not remember your dreams but trust that he is working and healing the situation in question. 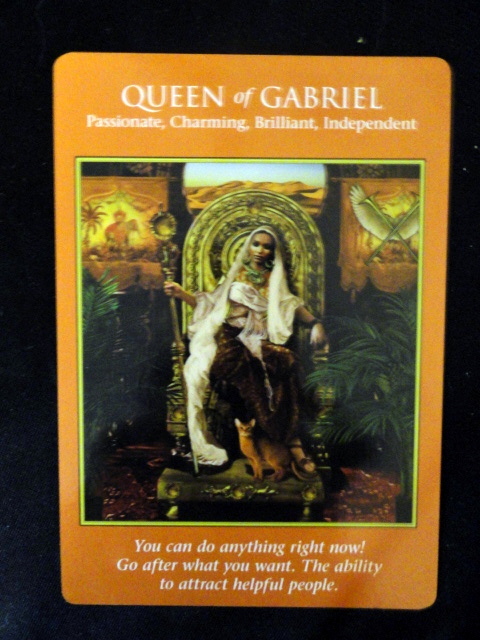 And for the next weekend we have the card, QUEEN OF GABRIEL. The message is, “ You can do anything right now! Go after what you want. The ability to attract helpful people.” By the weekend you will have new energy and sense of purpose to go for it! Your confidence level is high and you can do anything right now. All of the work you have done has paid off as others can see your tremendous accomplishment even if you cannot at this time. As law of attraction works your energy attracts like minded energies. Follow through on any guidance that you are receiving. Gabriel assists in creative projects! You are feeling confident and taking actions. It is a great week of being bold, addressing and cleaning up communications and allowing support to take your projects to the next level! Enjoy!